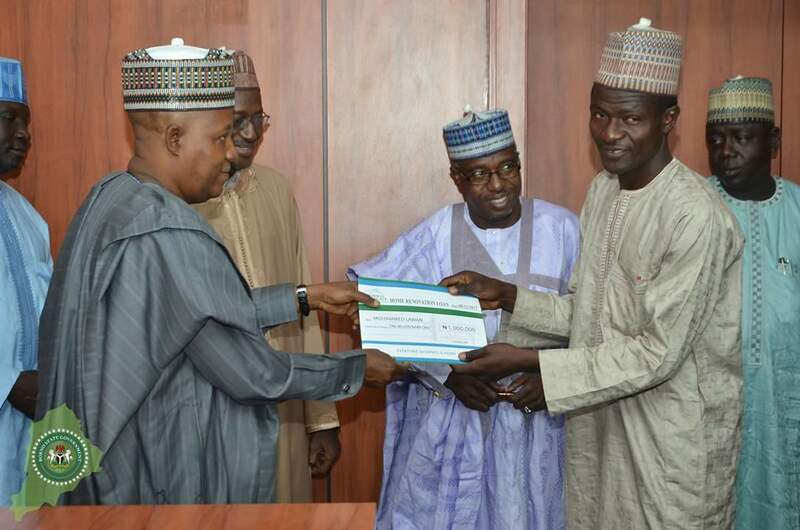 Seventy three civil servants in Borno State today received loans for renovation of their houses when the Managing Director of the Federal Mortgage Bank of Nigeria, Arc. Ahmed Musa Dangiwa led a delegation of the Bank on a courtesy visit to Governor Kashim Shettima. Each worker received a cheque of N1m from the visiting MD. The Bank also donated some relief materials to compliment the efforts of the Borno Government, FG and humanitarian agencies in caring for displaced persons. Governor Shettima thanked Arc. Dangiwa and his entourage for the visit and donation of relief materials to the State, as he charged the Mortgage Bank for more housing units across three senatorial zones of the State. “On behalf of the people and Government of Borno State, I wish to warmly welcome you and thank you more sincerely for your modest efforts in addressing our Humanitarian challenges in the State. “We are thankful for these items. It is not the quantum of items that matters but the spirit behind it. I want you to build more houses in towns like Biu, Bama and Monguno as these are our urban centers.” Shettima said. The Mortgage Bank assured of collaboration with the State Government to build more houses in parts of the three senatorial districts in Borno State to bring ease to workers in the State. “Today, we are in Borno state to commiserate with people of the State, and also to commend the State Government on the efforts of reconstruction and rehabilitation of destroyed communities. We also came to meet the Governor and donate our small gift to the IDPs. “We also come to solicit to the Government to back up remittances of National Housing Schemes which it had stopped over the years because of the challenges they faced. “We have some estates here. The military is now negotiating with us to make it their barracks at that strategic location along Damboa road” Dangiwa told journalists after meeting Shettima.